Thanks to generous donations from alumni donors and our recruiting partners, Macy’s and Bloomingdale’s, we offer the Clothing Closet free of charge to make sure you have everything you need to be successful in your job search! Currently enrolled students from the following schools are eligible to borrow items from the clothing closet service to attend an interview, career fair, or professional networking event. Alumni are not eligible to use this service. Spouses and family members of currently enrolled students are not eligible for this service. For women, we have black suits in sizes from W0 to W22. Most suit sets include a jacket, skirt, and pants. Women can also select clip-on pearl earrings and pearl necklaces as accessories. For men, we have black/navy/gray (select sizes) suits in sizes M36 to M46. We also have white dress shirts in sizes from M15 ½ — 34 to M17 ½ — 34, dress shoes in sizes from M9 to M10.5, ties in assorted colors and patterns, brown and black belts and overcoats in sizes from M40 to M42 for the winter. Students cannot mix and match suit sets. For example, a woman cannot borrow a size 2 skirt and a size 4 jacket. Students may only borrow one complete suit set of the same size. In order to borrow a suit, you’ll have to read and initial the policy agreement form. Please review the agreement carefully. Clothing Closet suits are University property and you’ll be responsible for any damaged, lost, or stolen items. If you don’t follow the Clothing Closet policies, you will be subject to a fine and Dean’s discipline. It is very important that you return suits in a timely manner. Failure to return a suit in wearable condition by the due date means that the student next in line will be left without a suit for his or her interview. Next, you will be asked to select your suit size and indicate the date you plan to come to CCE to try on and pick up your suit. Submit your request as early as possible so we can best accommodate you. Once we’ve received your request, we’ll send you an email with instructions to come to CCE to try on and pick up your suit. When preparing for an interview or event, please keep in mind that submitting a Clothing Closet request does not guarantee a reservation. CCE is located in East Campus, Lower Level. Students are welcome to come to CCE for the Clothing Closet Service Monday — Friday between 9:30 am and 4:30 pm. We have a dressing room for your convenience. Please check the suit before leaving to make sure that it is not damaged or stained. Alert the CCE staff member assisting you to any damages/stains. When you return the suit, it will be inspected for stains and tears. You will be responsible for any stains or damage that was not there when you picked it up. Also, please remember that these items are loaned to you, so returning them in the condition you received them helps us provide the Clothing Closet to your friends. Before you check out a suit, be sure to familiarize yourself with our policies regarding return dates and damages. The confirmation email you receive will include the date that your suit must be returned. Suits may be returned Monday — Friday between 9:30 am and 4:30 pm. Please note that we’re not open on weekends or University holidays. If your suit is due on a day when we’re closed, please return the suit by noon on the next day we are open. Please call CCE at (212) 854-5609 or email us at cce@columbia.edu if you have any questions. Do I have to dry clean the suit before I return it? No. We have our suits dry cleaned on a regular basis. Can I reserve more than one suit at a time? No. In order to accommodate as many requests as possible, you can only reserve one suit at a time. Once you’ve returned your suit, you’re welcome to submit another request. What do I do if I stain the suit? If you stain a suit, please do not dry clean the suit on your own. We dry clean our suits on a regular basis to make our suits last as long as possible. If the stain still does not come off after cleaning, you may be subject to a damage fee. What do I do if I rip the hem? If you damage a suit, you’ll be subject to a fine. The fine is $25 — $40 for minor repairs, $50 — $150 for moderate repairs, and $250 if the suit needs to be replaced. What happens if the suit is ripped or stained when I get it? If a suit is damaged when you’re checking it out, please make sure you let our staff know. We’ll make a note so you’re not responsible for the damage. How long do I get to keep the suit? Most students pick up their suit on Monday and return it on Friday. If you need to borrow the suit for longer than one week, please email us at cce@columbia.edu to explain the situation. I need to use the suit for a CCE career fair that does not end until Friday evening. I won’t be able to make it back to Your office by 4:30 PM. When can I return my suit? Will I be subject to a late fee if I bring it in on Monday? No. If you’re borrowing a suit for a CCE-sponsored career fair, you may return the suit the next day that our office is open. You will not be subject to a late fee. I need to use the suit for an interview or information session on Friday afternoon or over the weekend, so I cannot return the suit by 4:30 PM on Friday. Can I return the suit on Monday? Will I be charged a late fee? No, you will not be charged a late fee. You can return the suit to us on Monday. What do I do if I lose a suit? If you lose a suit, you are subject to a $250 replacement fee. What happens if I can’t return the suit on time? 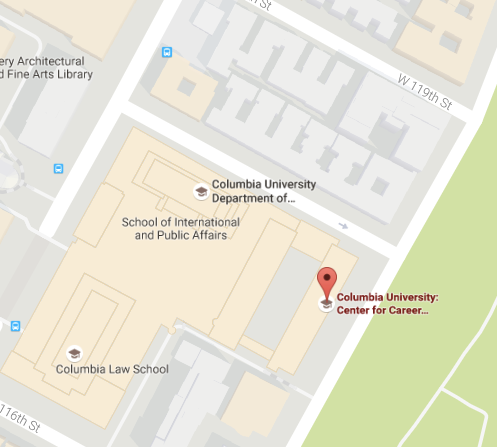 Please call CCE at (212) 854-5609 or email us at cce@columbia.edu to discuss your situation. I don’t need the suit anymore; what should I do? If you make a reservation, but decide you no longer need the suit, you must cancel your request at least 2 business days in advance. Failure to do so means that another student who may have wanted the suit is unable to check it out. To cancel your reservation, please call (212) 854-5609 or email us at cce@columbia.edu.